Cummings Veterinary Medicine | Can We Eradicate Goat Plague? An endangered subspecies of antelope that roamed the Earth at the same time as woolly mammoths now hovers on the brink of extinction because of an untreatable viral illness called peste des petits ruminants (PPR). The disease—also known as goat plague—has killed more than half of the 10,000 saiga antelopes remaining in Mongolia since late last year. Since PPR normally affects sheep and goats, international researchers are rushing to vaccinate and restrict the movement of those domestic animals in Mongolia in hopes of containing the highly contagious virus, likely transmitted via infected livestock sharing the antelopes’ grazing grounds. If they fail, PPR could threaten a number of other wild species, including the last of the Bactrian camels in southern Mongolia. PPR has long been the bane of some of the world’s poorest people. 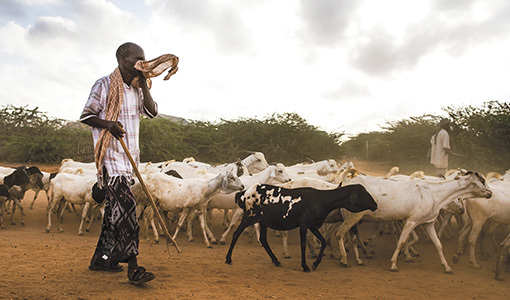 When Cummings School epidemiologist and professor Jeffrey Mariner, V87, and his collaborators analyzed PPR in 2015, they found that the disease cost sheep and goat herders around the world at least $1.5 billion annually. However, the researchers found that spending an estimated $3.1 billion on eradication efforts could wipe the virus off the planet. Inspired by those findings, the U.N. Food and Agriculture Organization and the World Organization for Animal Health acted swiftly, launching a global program in 2016 to eliminate PPR by 2030. Now, Mariner—a key player in the international program that eradicated rinderpest, a cattle plague—is undertaking a $2.5 million project, funded by the U.S. Agency for International Development, in which Tufts and University of Florida researchers will test new strategies for PPR control in Uganda and Kenya. Mariner shared five things to know about PPR.